A consistent finding of research into mobile learning guides and outdoor learning games has been the value of audio as a medium of communication. This paper discusses the value of location-based and movement-sensitive audio for learning. Three types of audio learning experience are distinguished, based primarily upon differing levels of narrative cohesion: audio vignettes, movement-based guides and mobile narratives. An analysis of projects in these three areas has resulted in the formulation of guidelines for the design of audio experiences. A case study of a novel audio experience, called ‘A Chaotic Encounter,’ delivers an adaptive story based on the pattern of movements of the user. A consistent finding of research into mobile learning guides and outdoor learning games has been the value of audio as a medium of communication (see e.g., Bhaskar & Govindarajulu, 2010; Naismith, Sharples, & Ting, 2005; Schwabe & Goth, 2005). This complements earlier findings from studies of distance learning which showed that students like being informed by the voice of their educator, listening to interviews or debates, hearing from experts and being encouraged with a reassuring audio message (Durbridge, 1984). The difficulty with audio as an instructional medium is that it can be hard to concentrate on a voice for long periods, it is difficult to retain de-contextualised audio information for later reflection (Laurillard, 2002) and some topics can be explained more effectively through pictures or graphics (McConnell & Sharples, 1983; Minocha & Booth, 2008). This indicates two, diverging, opportunities to exploit audio as a medium for mobile learning: in podcasts, where the audio is de-contextualised and may need to be supplemented by graphics, images or video to explain or illustrate a topic; and in location-based guides, where the physical surroundings complement the audio commentary. The focus of this paper is on the latter, with a broad scope of audio experiences that include guides, games and stories, either matched to location by position-sensing technology such as GPS, or that respond to the physical movement of the user. Minimise the need for learners to interact with the device, so that that they have a ‘heads up’ continual flow of visual information rather than frequently shifting gaze between the scenery and the screen. Physical movement around the environment can provide an effective method of interaction (Bristow, Baber, Cross, & Woolley, 2002). Contextualised information can be adapted to the user’s preferences and profile, their route, their current position and orientation and how long they have been at the current position. Thus a person’s movement and position can provide means of interacting with a combination of the physical surroundings and audio educational material, without the need to gaze at a screen or press buttons. This paper provides an overview of the use of audio for location-based encounters. 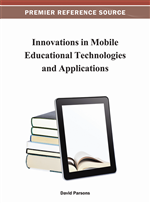 It provides a classification of types of verbal audio and examples of their implementation in mobile learning systems, followed by guidelines for the effective use of audio, drawn from the examples. We then present a case study called ‘A Chaotic Encounter’, as an example of a novel approach that combines movement-based guides with mobile narratives (i.e., an adaptive narrative). We report an evaluation with ten users along with suggestions for future work. Audio has been used effectively in many location-based experiences, including mobile gaming (Drewes, Mynatt, & Gandy, 2000; Lyons, Gandy, & Starner, 2000); tourism (Aoki et al., 2002; Naismith et al., 2005); educational visits (O'Hara et al., 2007; Vavoula, Sharples, Rudman, Meek, & Lonsdale, 2009) and theatrical events (e.g., Hotter than Hell, http://www.aerial.fm/docs/projects.php?id=101:0:0:0), or a combination of these activities (Rowland et al., 2009; Schnädelbach et al., 2008).